There are actually two ways that this bracelet can save your skin. On the side of this guy is a note saying: “Apply sunscreen to this side”. If the user cannot read this, it would be a good idea to quit their day at the beach. Now there’s something I wish I would have done yesterday. 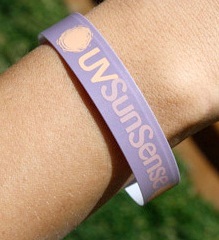 Well, if you want to get down on this tech, feel free to purchase a 7-pack of UVSunSense from Amazon for just $5.87.